Press each biscuit into 6-inch round. Place on 2 large or 3 small greased cookie sheets. 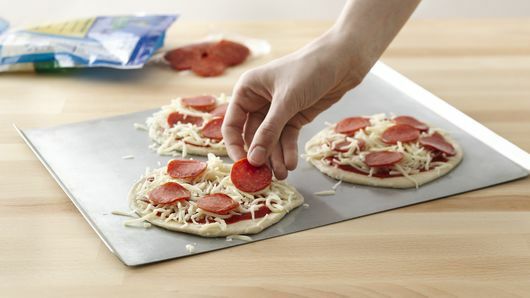 Top each round with pizza sauce, cheese and pepperoni. Bake at 375°F 10 to 15 minutes or until bottoms are deep golden brown and cheese is bubbly. Omit pepperoni. Cook chopped onions, sliced mushrooms and sliced red bell pepper in 1 tablespoon olive oil about 5 minutes or until peppers are limp. Top each biscuit with pizza sauce, cheese and veggie mixture. Omit pizza sauce and pepperoni. Top each biscuit with cheese, canned pineapple tidbits, diced green bell pepper and sliced Canadian bacon or ham. Don't need 8 mini pizzas? Use the 5-pack of biscuits instead. You'll need about 3/4 cup pizza sauce and 1 1/4 cups cheese. Fact: Pizza is basically the perfect food. It would be hard to find a way to love it even more—that is, unless you made it smaller (and therefore cuter). Allow us to introduce you to what is, in our humble opinion, the best (and cutest) mini pizza recipe you’ll ever try. What makes it so good? It all comes down to the crust. 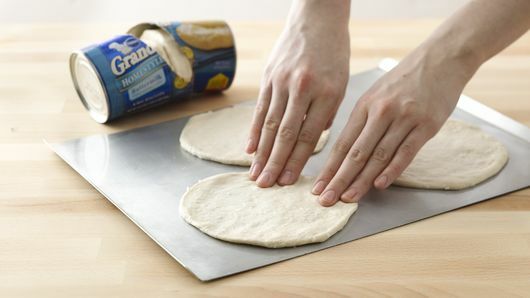 Our trick: Pop open a can of flaky Pillsbury biscuits and use them for the perfect base. 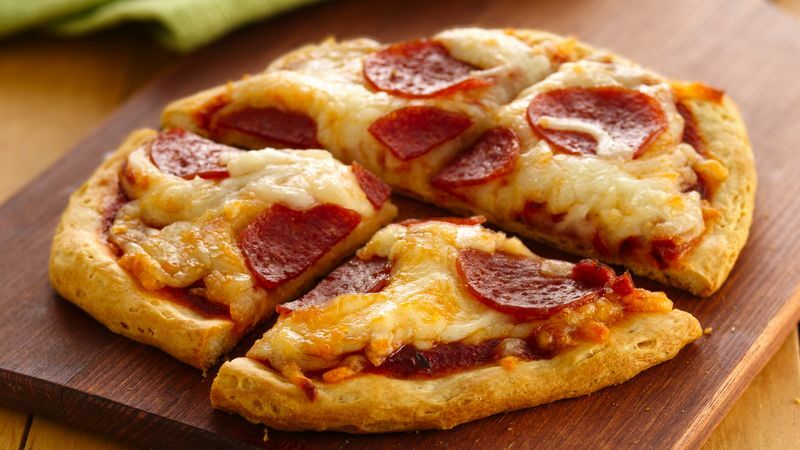 Your mini pizza will cook up with a golden, chewy crust that’s soft and fluffy on the inside, crisp on the outside, and a truly worthy base for the power trio that is pizza sauce, cheese and pepperoni. And just like that, you’ve made the best pizza of your life—that just happens to be the most adorable, too.